China chalked up unexpectedly strong year-on-year growth in the first quarter of 11.9 percent, prompting renewed calls for tighter policies to prevent the world's third-largest economy from bubbling over. The rate of expansion, the fastest since 2007 and above the median forecast of 11.5 percent in a Reuters poll, was flattered by a low base of comparison a year earlier, when the economy was reeling from the global financial crisis, Reuters reports. Inflation stayed low at 2.2 percent, below the government's target of 3 percent for the year, easing pressure for immediate interest rate hikes or other steps to cool the boom. 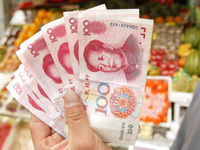 But analysts said Beijing needs to act soon to head off mounting pressure for prices to rise. After a Cabinet meeting late Wednesday, the government said it wants to keep real estate and other overheated industries in check and was looking into a possible tax on real estate gains to cool surging prices, The Associated Press informs.